Paniolo Trading - Buy One Get One Gift Cards! Purchase one (1) $50 Gift Card and get a second one FREE! For over 40 years, paniolo trading has been hawaii's specialty western-wear boutique. Standing strong in their original location on first floor by center stage in ala moana, paniolo trading is proud to continue to offer authentic hats, boots, jeans, shirts, belts, buckles, jewelry, accessories and everything else "paniolo", the hawaiian word for "cowboy". Carrying well-known brands like tony lama, justin and ariat boots; stetson and resistol hats; wrangler jeans and shirts; minnetonka moccasins; montana silversmith, sunset trails and comstock heritage belt buckles; and authentic native american indian jewelry and gifts - you're sure to find that unique item for your special cowboy or cowgirl at paniolo trading this holiday season! 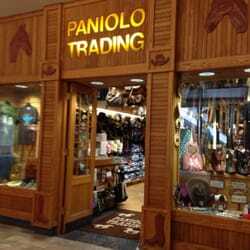 **visit "paniolo trading" between 6am-10am on friday, november 23rd for a 10% discount off regularly priced items! **also, on november 23rd, receive a free dreamcatcher keyring with $75 purchase - while supplies last! Call 808-973-1333 or visit www.paniolotradinghawaii.com for more information!